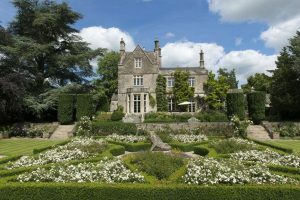 1) (Ampney Park, co. Gloucester). Ar. a greyhound courant sa. on a chief dancettee of the last, three bezants. Crest—Two arms embowed, in scale armour hands ppr. holding up a greyhound’s head couped at the neck gu. collared sa. 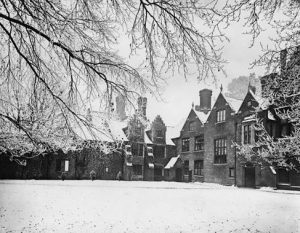 2) (Sprouston Hall, co. Norfolk). Paly of six ar. and az. on a chief gu. a lion pass. guard. or, all within a bordure erm. Crest—A swan’s head and neck erased ar. ducally gorged or. 3) Paly of six ar. and az. on a chief gu. a lion pass. guard. or. 4) Ar. a greyhound in full course sa. on a chief of the second three bezants. 5) (London). Ar. a greyhound courant sa. on a chief indented of the second, three bezants. Crest—A dexter hand gauntleted, holding a pheon all ppr. 6) (Blackwall, in the Peak, co. Derby, there seated in the time of Henry III.). Ar. a greyhound in full course sa. collared chequy or and gu., on a chief dancettee of the second three bezants. Crest—Two arms embowed, habited in mail ppr. hands ar. holding betw. them by the nose and ear a greyhound’s head couped sa. collared chequy or and gu. Another Crest—A griffin’s head erased sa. beaked and eared or, charged on the neck with a bar gemelle ar. and a trefoil slipped erm. 7) (Blackwall-Evans). (Idridgehay, co. Derby). Quarterly, 1st and 4th, ar. a chev. betw. three boars’ beads couped sa, for Evans; 2nd and 3rd, ar. a greyhound courant sa. collared chequy or and gu. on a chief indented of the second three bezants, for Blackwall. Crests—1st: On a ducal coronet or, a boar’s head erased fessways gu., Evans; 2nd: Two arms embowed habited in mail ppr. holding a greyhound’s head couped at the neck sa. collared chequy or and gu., Blackwall. 8) (confirmed to John Blackwall, Esq., in the year 1764). Ar. a greyhound courant sa. collared chequy or and gu. on a chief indented of the second three bezants. Crest—A greyhound’s head couped sa. collared chequy or and gu. betw. two arms embowed, habited in mail ppr. 9) Ar. three trefoils slipped sa. on a chief of the last a lion ramp. of the first. Crest—A demi lion holding in the paws an anchor ppr. 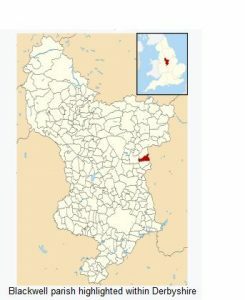 This surname is a local one meaning “of Blackwell”, a parish in county Derby near Derby in Alfreton, and also a township in the parish of Darlington in county Durham, as well as other smaller locales. In his book, Homes of Family Names, H.B Guppy states “Blackwell is an old Gloucestershiresurname, perhaps originally derived from the parish of Blackwell in the neighbouring county of Worcester”. The etymology of the word is as follows: the Old English word bloec (black or dark) and woell (spring or stream), meaning dark stream, referring to a person who live near a black stream. The earliest recording of this name was in 964 AD in the Saxon Cartularium of Durham, as Blacwaelle, and in the Domesday Book for Derbyshire in 1086 AD, as Blacheuuelle. Early people recorded bearing this last name include Margery de Blacwelle, recorded in county Cambridge in 1273 AD in the Hundred Rolls, as well as Thomas Blackewell and Margareta de Blakwell, recorded in the Poll Tax of Yorkshire and Howdenshire, respectively, in 1379 AD. Other early documented persons include Benedictus de Blakewell in the Assize Court Rolls of Durham in 1243 AD and Mauriciys de Blacwella in the Pipe Rolls of Derbyshire in 1175 AD. Early marriages involving this surname include William Blackwell to Jemima Fowle at St. George’s Chapel in Mayfair in 1753 AD. Early recorded Americans bearing this surname include Michael (or Myles?) 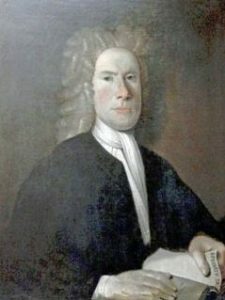 Blackwell of Sandwich, MA, who had three children John, Joshua, and Jane. Another includes Jeremy Blackwell who came to New England aboard the Truelove in September of 1635. One Elias Blackweller was recorded (buried) in the parish of St. Michael’s in Barbados in May of 1679. Oyhers include Roger Blackwell (Virginia 1635), Andrew Blackwell (Virginia 1638), and Robert Blackwell (New York, 1772). The largest groups of Blackwells in England by the sixteenth century were those from the 1) Peak District of Derbyshire, 2) western England in the area of Gloucester, and 3) the Middlesex/Hertfordshire area north of London. 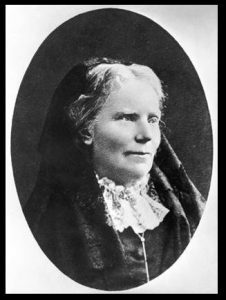 Famous or notable people with this last name include Elizabeth Blackwell (1821-1910) who was the first woman to receive a medical degree in the United States, George Blackwell (1545-1613) who was an English Roman Catholic Archpriest, and Julius W. Blackwell (1797-1845) who was a US Congressman from Tennessee. I would like to purchase a large digital print of a Coat of arms- Blackwell – but your website has been under maintenance for a long time. Is there any chance it will be up and running within the next 2 weeks? If not can you advise me please how I can get one.